The downlight definition can vary depending on whom you ask, but generally speaking, downlighting refers to any light that is mounted in a high place and aimed downward at a surface, object, or general area. The term is often used interchangeably with �recessed lights�, which are downlights that have been mounted within an opening in the ceiling. Recessed downlights,also known as can lights or pot lights, are an excellent choice for many residential and commercial applications. These versatile lights give a clean, modern and attractive look to their surroundings and will work in practically any room. Homeowners and business owners can use them in a variety of ways for general lighting or to highlight specific parts of a room. What are the common uses of recessed downlights? 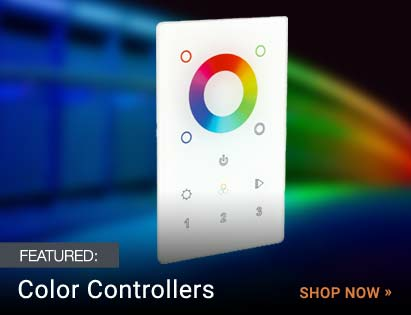 They can provide ambient or general light to give broad, even light to an entire room. Alternatively, they can provide accent lighting, highlighting a painting, sculpture or other object that warrants attention. Recessed downlights can be used as task lighting over work desks, providing concentrated light on a project. Finally, these lights can be used for wall-washing to make a room look bigger and more attractive. Recessed downlights typically require three primary components for installation. Even so, they�re not particularly difficult to install. The first thing you�ll need is a housing to contain the light. The housing is hidden above the ceiling and encloses all the parts of the downlight fixture. Sometimes the housing is purchased separately and sometimes it is integrated into the full fixture. When choosing recessed lighting, an important consideration of the housing is whether or not you need it to be insulated or air tight (AT). Insulated (IC-rated) housings mean that the downlight is allowed to be in direct contact with the insulation that is above the ceiling. This is important if you need to maintain a continuous thermal break or need continuous insulation coverage between two floors of a building. Downlight housings that are AT prevent the conditioned air leakage below the ceiling from seeping into the unconditioned plenum space above. This air sealing will save on heating and cooling costs. In addition to the housing, recessed lights also require trim. The trim is the finished portion of the downlight that you see below the ceiling. It comes in many different styles that can manipulate the light in different ways as well as provide different desirable aesthetics. Reflector (also called multiplier) trims provide the most light by reflecting the light from the light source, which increase its brightness and effect. 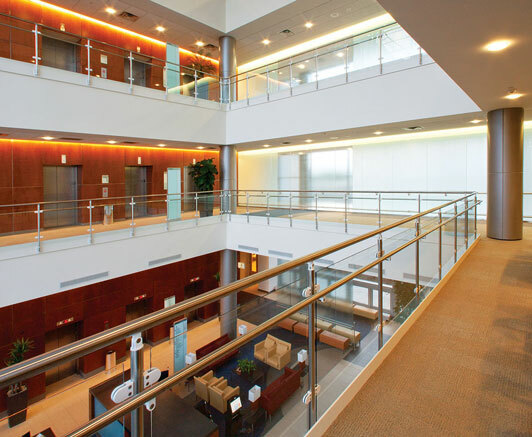 Baffle trims are useful in providing a matte, diffused light output that reduces glare. Adjustable (also called eyeball) trims allows you to swivel and direct the light at a particular object. Shower lens trim is waterproof, which makes it perfect not just for showers and bathrooms, but for any place where water might be an issue � including outdoor installations. Wall wash trim masks off a portion of the downlight�s aperture to direct it in one direction only. Finally, you must select a light source to provide the actual illumination in your recessed lighting. The types of bulbs you can use in recessed lighting include halogen, fluorescent, incandescent, and LED. Each of these bulbs has its pros and cons. The housing usually includes instructions from the manufacturer on suggested bulb types, which makes your choice easier. In addition, most LED downlight trims contain an integrated LED module and have no need for separate bulbs. The experienced staff at Take Three Lighting is always ready to help you with your choice of bulbs, trim and housing or with any questions you may have. 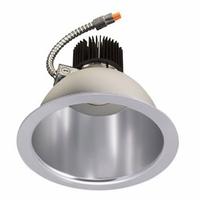 One other factor to consider in the overall design of a recessed downlight is regression. Regression is essentially how �recessed� the downlight really is. A fixture with full, or �deep�, regression means that the light source is seated high up into the housing and the surrounding trim is deep. A fully regressed downlight fixture provides less distracting glare, as the light source is less visible when viewing the downlight from a distance. This leads to a more comfortable and pleasing visual experience. Less expensive fixtures will have little to no regression and will situate the light source near the ceiling plane. This shallower design produces more glare and can cause eye fatigue. By now, you should have an idea of what to look for in a downlight fixture. But what size do you get? Aperture sizes range anywhere from 2-inches up to 8-inches in diameter. Generally, the 6-inch size is a good multi-purpose choice for general illumination applications with 8�-0� to 10�-0� ceilings. Smaller sizes are more inconspicuous and can be more desirable in architecturally-significant spaces. Traditionally, smaller sizes were only useful in task or accent lighting with lower light level needs. But with new efficient LEDs, small 2-inch, 3-inch, and 4-inch downlights can pack a lot of light output in a small package, giving an appealing �punch� to your space. Rooms with higher ceilings (above 10 feet) will typically require more light output and will benefit from downlights that can meet this high output task. How do you install recessed downlights? Installing recessed lighting is usually a straightforward process. New construction lights can be used for new construction, of course, but you also may be able to use them if you have access to the space above your ceiling - via an attic, for instance. With new construction, you simply install the housing with hanger bars secured to above-ceiling framing members (or a suspended ceiling grid), wire the fixture to a junction box and put in the trim. With a remodel-style downlight, you cut a hole in the existing ceiling using a template, wire the fixture, push it up into the ceiling, and secure it with clips. If you have existing downlights, but you want to convert them to a more energy efficient LED model, then you should opt for an LED retrofit-style downlight, which is designed to utilize your existing housing and replaces the existing light source with a new LED light engine. Before you get started, however, you should decide exactly what type of lighting you want in your rooms and if you want to highlight anything in particular. The height of your ceiling, the distance between the joists in your ceiling and the overall use of the space can all make a difference in what is the perfect downlight for you. For expert advice on your recessed downlight project, just give the friendly, experienced staff at Take Three Lighting a call. How do you decide what kind of lighting to get? 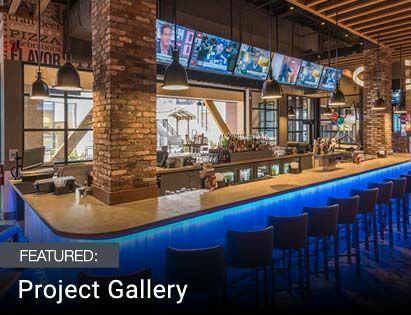 The kind of light you will need for your situation depends on many factors, including the space to be illuminated, what the activity will be in the space and who will be using it. As humans age, for instance, their eyesight declines, and they need more light to see. Thus, a classroom for elementary school children would need less illumination than an office for working adults. The requirement for light also depends on activity. Though elderly retirees would need more light to see than working adults and children, they are less likely to need high foot-candles unless they happen to be doing a hobby that requires intense light. Likewise, the space itself will help dictate lighting requirements. 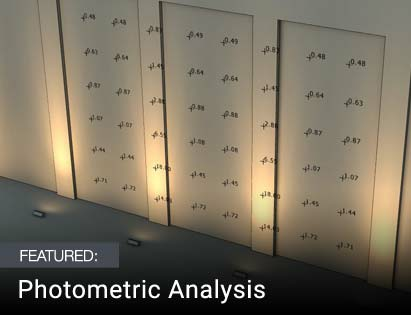 An outdoor public area surrounded by darkness will require less lighting than an office or classroom, for instance, and a typical office or classroom will need less lighting than a laboratory in which minute, detailed measurements and experiments are being carried out. If more precise work is being done, you should also look at choosing recessed lighting with a cooler color temperature (4000K and up), as this will be easier on your eyes since the temperature is closer to daylight and can more accurately render colors and objects.